When it comes to documentaries, the BBC are the penultimate providers of quality productions and this four disc collection entitled Life is no exception to that rule. Filmed over a three years, this ten-part documentary showcases life on planet Earth but what makes this experience so special is the outstanding video and audio quality which mesmerises you like a hypnotist with a watch. Some of the footage is visually quite surreal like the Dolphins hunting together as a pack or the high speed footage of the spatule-tail hummingbird. This is all made possible by the professional crew which use some of the world's state of the art cinematography techniques and technology to ensure that the viewer is treated to a visual overload. Needless to say, it works quite well. Although the documentary is entitled Life, it doesn’t sugar coat how hard existence is for creatures of this planet that is highlighted by a particular scene where a baby elephant gets stuck in mud. The mother valiantly tries to push it out but her interference actually hampers the rescue effort until an elder female elephant comes along to save the day. It’s quite an emotional scene that almost brought a tear to my eye and once again cements that animals are not mindless creatures but have similar motivations and feelings like humans. With so many animals and plant life showcased in this documentary, at times, I was left in wonder and could not believe what I was seeing. For instance, a giant octopus actually guards her eggs for 6-months before leaving the nest. By protecting the children, she ensures that the next generation of Pacific giant octopus have a chance in this difficult environment. Apart from animals and as mentioned, the documentary also goes into good detail about other living organisms such as plants which are life veins of mother Earth. From plants in the Amazon that attempt to climb towards the sunlight or more carnivorous ones like the Venus flytrap which sustain their existence by consuming their prey, the series may be a visual overload but at times it is an information overload but thankfully in a good way. 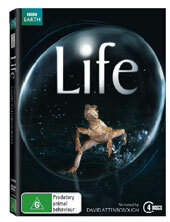 The narration of Life is knowledgeably done by David Attenborough who was born for roles like this. His voice matches the amazing stories and footage perfectly that is not condescending but speaks on a level that no matter what your age or life experiences are, it will relate to everyone. My favourite episode in this collection was its final episode which was The Making of Life. This goes into great detail of how they captured the footage and amazingly enough, it took over 3,000 days of filming to create this spectacular documentary. As mentioned, the video quality is visually quite eye-catching on DVD that highlights life on this magnificent planet quite well, especially from its colours and amazing cinematography techniques employed in the movie. The colours are vibrant, the images are crystal clear and on FULL HD TV’s, the result is literally quite breathtaking. The soundtrack supports Dolby Digital 5.1 and although isn’t really used, it does sound quite clear and sharp, especially from the sounds of all these creatures and the ambience of the environment. This is a documentary that can be watched by individuals of all ages, whether families, couples or older persons, Life will capture you from its very first moments and leave you captivated from start to finish. This is how documentaries should be made, highly recommended!